Mobile analytics company OpenSignal has had a look mobile and wifi performance around the world and concluded wifi is losing its crown. The report is flawed and the conclusions – including this news headline – are flat our false. 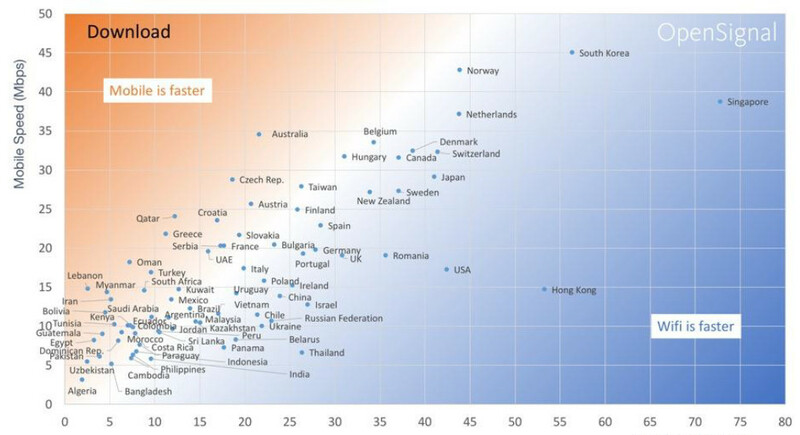 In nearly every country that reasonably represents a developed market, Wi-Fi is substantially and irrefutably faster. This is fact and easy to prove for example with data from Netradar and elsewhere. When Australia is used as the example, and your mate’s WiFi is dependent on the available internet provided to blow through it, you see the problem. With Australia’s “dial-up” speeds to broadcast through WiFi, it all fails. This report is comical, at best. 5G will be no better than the amount of internet you can blow through the 5G device. In the case of rural America, it will be an improvement, most likely. But, apples to apples, with equal internet throughput, WiFi will outperform, as 5G will have inherent limits on throughput. We can not know what those are yet, because no one has seen them yet. I’ll hold my breath.